Here’s what I really liked about this book: the quotes. I know, I know, every business book has great quotes (and I’ve read several this year already). But, Omar Garcia nails the right quote for the right situation every time. I plan on keeping this book by my desk and looking up a quote whenever I need it. Here’s what else I really liked: the QR codes and references at the end of each chapter. If you want to follow-up with more information in any of the book’s subjects, it is only a phone scan away. Each of the references—and there are a ton of them—are easily accessed at the end of the chapter (versus at the end of the book). Omar Garcia did an excellent job of including scientific and business research throughout his book. Now, meat and potatoes time. Garcia has taken his research and put it together in an easily digestible format. He mixes philosophy, research, and analogy together to present his case. Sometime the analogies are a bit weak compared to what we’ve heard elsewhere (like inventing company names like Crummyworks, Okworks, and Goodworks), but Garcia makes up for it with his straight talk. Besides the aforementioned quotes, there are gray boxes throughout that capture the essence of what is being discussed. The editing team did a fantastic job. The essence of Garcia’s philosophies, like business wonder Daniel Pink, comes from the findings of Edward Deci and Mihaly Csikszentmihalyi. The idea here is that we are driven (compare Pink’s title DRIVE and Garcia’s DRIVEN ORGANIZATION) by more than money and that we can become energized by our work. Garcia takes it a step further and uses Maslow’s hierarchy to rationalize the need to learn and create. Like Pink, Garcia comes up with his own claim to fame, called S.P.A.C.E.S. These areas are not unlike Pink’s Autonomy, Purpose, and Mastery; Garcia keeps these three and adds three more. They are: Salary, Purpose, Autonomy, Competence, Environment, and Strategy. Now, here’s what really bothered me about the book: the illustrations on the front cover. I was sent a hardbound book to review (thank you) and everything about it spoke professionalism—minus the artwork. The text layout, the dust jacket, the author bio, everything was good. Not that the illustrations aren’t good—they are—but they distract from the serious and professional concepts the book tries to convey. I’ve read many business books over the last several months and this one holds its own merit. Even if you’ve read most of the other books out there, there is still a ton of information stuffed in this book. 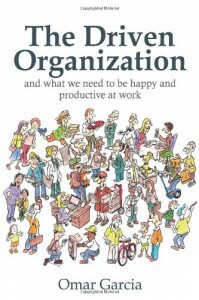 Anyone willing to take the time to go through it will notice definite improvement in their organization’s life. I’m giving this 3.5 stars.